The city of Lancaster has a rich and diverse history that began in the late 1600’s as a part of the Penn’s Woods Charter, a 45,000 square mile land grant to establish an English Quaker Colony in the New World. The area of Lancaster would develop and flourish around rich agricultural land and the development of iron forges throughout the 1700’s. As iron production increased the need to develop road networks became necessary to bring in raw materials and transport finished product to market, the Philadelphia & Lancaster Turnpike was one of the first, opening in 1795. 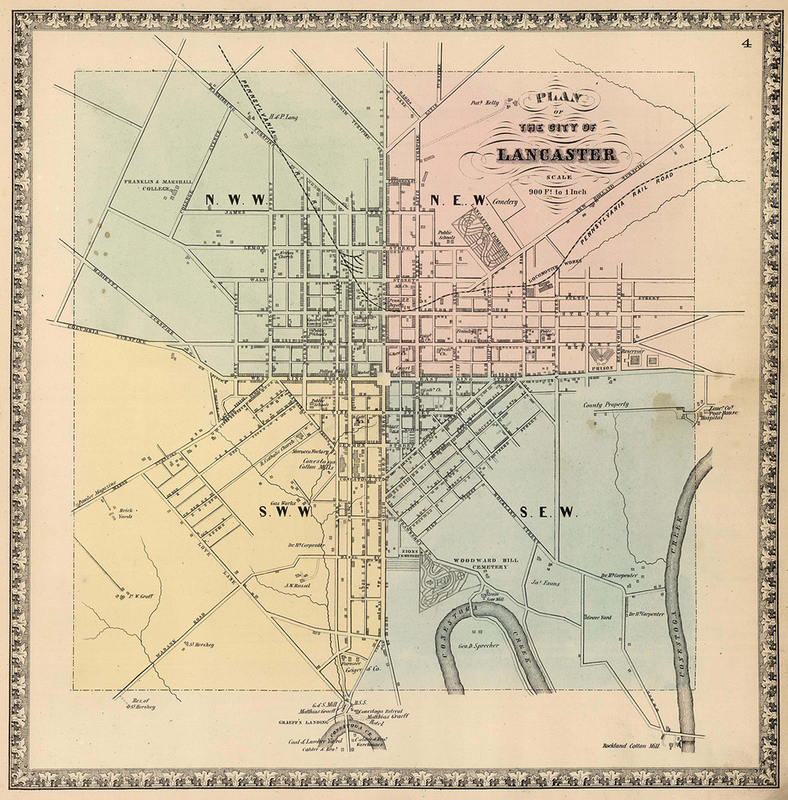 Lancaster held the honor of being the state capitol from 1799-1812 and was incorporated as a city in 1818 developing at the crossroads of trade routes connecting Philadelphia with manufacturing centers like Columbia, York, Lebanon and Portsmouth (Middletown). City of Lancaster, circa 1864. David Rumsey Map Collection. Early in the first quarter of the 19th Century construction of the Erie Canal put the state of New York at a great advantage over Philadelphia and the Comonwealth in trade and commerce. In an effort to compete, Pennsylvania would embark on a similar project known as the Main Line of Public Works, an ambitious network that utilized a multimodal system of railroads and canals. While the Erie Canal was in use by 1821, Pennsylvania did not break ground until 1828 and the network was not complete until 1834. What would determine success of these networks was ultimately the topography. The Commonwealth was far more challenging than the water level route of the Erie putting the Main Line of Public Works at a major disadvantage. The Main Line of Public Works network required multiple transfers to move cargo from train to boat in Columbia, back to train in Hollidaysburg, onto inclined planes to surmount the Alleghenies, and back to boat in Johnstown. Though the trip was a vast improvement over wagon travel, it was still hampered by logistics and weather. Though woefully under-engineered the only potential success of this network was found on the east end, the Philadelphia & Columbia Railroad which ran the 82 miles between its namesake towns with Lancaster along the way. Detail of an 1855 map illustrating the Pennsylvania Railroad system and its connections. This map shows the proposed Lebanon, Lancaster & Pinegrove Railroad which was to bypass the Philadelphia & Columbia to gain access to Philadelphia prior to the Commonwealth and the PRR coming to an agreement on the sale price of the failing Main Line of Public Works in 1857. Map collection of the Library of Congress. The potential success of this new railroad spurred private ventures to construct connecting lines like the Harrisburg, Portsmouth, Mount Joy & Lancaster Railroad (H&L for short) which completed its route in 1838 bypassing the train-boat transfer in Columbia and thus connecting local industry to an all rail route to Philadelphia. Recognizing the overall failure of the Main Line of Public Works the Commonwealth deemed that a private venture should be chartered to construct an all rail route from Harrisburg to Pittsburgh in order to preserve and improve trade and commerce, therefore in 1846 the Pennsylvania Railroad was born. Once the PRR route was complete to Pittsburgh, lines east of Harrisburg including the H&L and P&C became the object of desire for the young railroad striving to complete an exclusive rail network between Philadelphia and Pittsburgh. An operating arrangement was established with the H&L in 1848 leaving one last lynch pin, the now cash starved P&C. The Commonwealth offered the entire Main Line of Public Works system for sale in 1854 but it wasn’t until 1857 that the PRR would agree to purchase the system for $7.5 million, almost a third of the original asking price. This purchase secured the final segment of a wholly owned rail route between Pittsburgh and Philadelphia while also providing the surplus canal right of way that would be crucial to expanding and improving the main line west of Harrisburg. With the potential for increased traffic the railroad began improvements to its main line system, an endeavor that would continue on and off well into the 20th Century. Antiquated facilities in Lancaster were a continuing concern; construction commenced on a new station in 1860, several bridges were improved, the physical plant expanded and finally a by-pass route was built around the congested city center in 1883. By 1904 the main line of the Pennsylvania Railroad from Philadelphia to the Conestoga River was four tracks wide. In Lancaster the complex terminal reduced down from four tracks to two on the east end, splitting twice, once between the old main and the 1883 Lancaster cut-off and again at Dillerville where the old main (former H&L) connected back to the cut-off and the former P&C diverged to Columbia. Though plagued by the two track bottleneck over the Conestoga for some time, completion of the Atglen & Susquehanna branch in 1906 diverted a considerable amount of freight traffic away from Lancaster to the east and the two track Conestoga Bridge would remain as is, adequate to handle the remaining traffic on the main line. 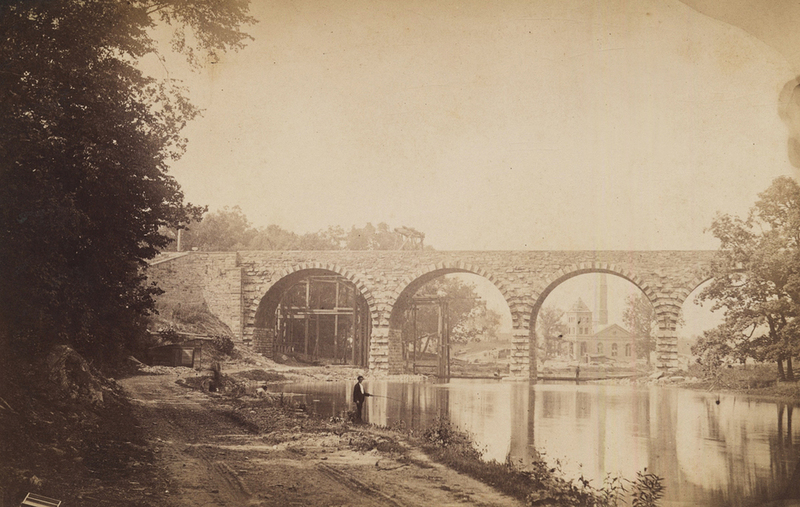 One of many early improvements in the Lancaster terminal area was the stone bridge over the Conestoga River where the main line from the east entered Lancaster. Designed by Chief Engineer William H. Brown and completed in 1887 the two track Conestoga Bridge is unique in its design as the south side was left with protruding stonework to allow for further expansion had the railroad required additional capacity. Though this bridge was an operational bottleneck when the mai nline east was four-tracked subsequent construction of the Atglen and Susquehanna branch alleviated much of the through freight congestion in the Lancaster area. Image courtesy of LancasterHistory.org, Lancaster, Pennsylvania. Terminal improvements continued in the 1920’s including the abandonment of the old main and 1860 station in favor of a new passenger station on the cut-off providing expanded train service, the result of political pressure and some gentle encouragement from Armstrong Cork a major PRR customer in Lancaster. Around the same time electrification was sweeping the eastern main line, preparations were being made to modernize area interlocking plants which were centralized to a single tower appropriately named Lancaster (renamed CORK a few years after its construction for the neighboring plant of Armstrong Cork). In 1938 electrification of the Paoli – Harrisburg main line, Low Grade and Columbia branch were complete; Electric locomotives were now hauling the bulk of freight and passenger trains west to Harrisburg, leaving steam and later diesel propulsion to switch sprawling industries scattered about on the remaining sections of the old main, Dillerville area, Quarryville and New Holland branches. Part of the last wave of Pennsylvania Railroad improvements in the Lancaster area was the 1927 abandonment of the old main line and station through town and the opening of the new passenger station on what was formerly the Lancaster Cut-Off, now essentially the new main line. Further improvements came in 1938 with the completion of the final phase of electrification including the main line from Paoli to Harrisburg, the Low Grade and Columbia branch. Illustrated here in a view looking east is the new station facility and Cork interlocking tower which consolidated control of several interlockings in the Lancaster area. Image collection of the author. Lancaster and the railroad thrived during the surge of World War II traffic but as peacetime settled in, the PRR began to show its age, left with mounting debts and a worn out physical plant. With a decrease in traffic and increasing competition from trucking the rationing of their physical plant began in the early 1960’s removing two of the main tracks east of the Conestoga Bridge to Parkesburg. Traffic continued to diminish and the ill-fated merger of the NYC and PRR drained cash away from much needed infrastructure improvements. In 1971 Amtrak was created to preserve national passenger train service, on the Harrisburg Line the new company slowly began carving away at money loosing local, regional and long distance services the PRR once provided. In 1976 Conrail assumed control of freight operations in the Lancaster/Dillerville area which continues to generating traffic from a number of large industrial plants and new distribution warehouses. In the late 1990’s the future of Lancaster’s railroads faced more changes. Conrail was split up by CSX Transportation and Norfolk Southern Corporation, the later which assumed control of Lancaster freight operations. Amtrak’s Keystone Line was designated a high-speed corridor and work slowly began to rebuild the Harrisburg - Philadelphia main line for hourly electrified service once again. In 2008 Franklin & Marshall College and Lancaster General Hospital struck an agreement with NS to develop the land along the former old main that was retained for yard and bulk transfer facilites for the railroad. NS commenced a long-term project to move, reconfigure and expand Dillerville Yard all of which was completed at the close of 2013. Today contractors are removing the remaining traces of the old main changing the local landscape forever. Amtrak’s rebuilding of the former PRR Main Line is largely complete including the tumultuous rehab of Lancaster’s 1929 depot, the streamlining of the physical plant and the closing of Cork tower, one of a few left on the former PRR system. Though the PRR has been absent from the Lancaster area for over 45 years its legacy remains a vital infrastructure to the local economy. Over the next few months we will spend some time exploring the various lines and history of the Lancaster area including current and historic facilities.